Create a natural looking haven for bluebirds in your yard by placing this Heath Birch Pattern Natural Living Bluebird House in it. This detailed, polyurethane home perfectly mimics a birch log, for a wonderful arboreal look in your yard. The handpainted white body captures attention in moments, while black and gray hints beneath it add dimension and realism. Uneven, impressed horizontal lines on this exterior perfectly mimic the texture of a birch log, and the soft brown tone of the top and base of the unit complete this effect. 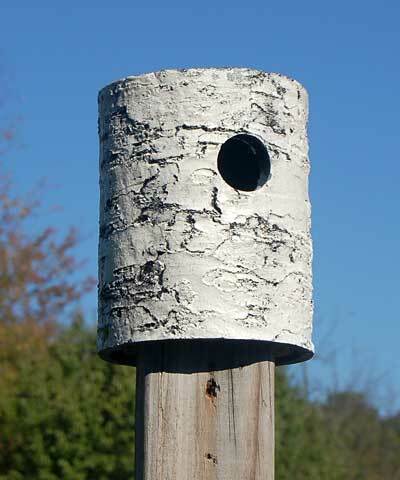 A 1.5" diameter entry hole rests on the front of the piece, allowing bluebirds to access the interior, and the base of the home removes for seasonal maintenance. An included screw allows you to post mount this shelter with ease, and a slight gap around the base helps the nest remain dry. The polyurethane body forms a sturdy shelter, and the UV resistant paint ensures it looks great for many seasons. Celebrate trees and birds in your backyard with this Birch Pattern Natural Living Bluebird House. Made in the USA.